Kantar Media is launching Twitter TV Ratings in the UK this year which allows broadcasters, media agencies and others to look at the relationship between Twitter and TV. A relevant development considering that around 40% of all UK Twitter traffic at peak time is related to TV. As a warm up to the launch of Twitter TV Ratings Kantar Media has released a report that examines the the relationship and correlation between TV viewing levels and Twitter. The data for the research comes from the period from 1 June 2013 to 31 May 2014 and takes in over 110 million TV-related Tweets from over 13 million unique users in the UK. Our analysis confirms that Twitter amplifies the power of TV as a medium, can increase ratings and is a rich source of insight about TV viewing. As a metric, it can complement TV ratings and Audience Appreciation data. To make the most of Social TV analysis it is important to understand the nature of the relationship that different shows and genres have with the medium, both in terms of the volume and ‘shape’ of Twitter activity they can be expected to generate. High quality analysis of Twitter data is essential. Simply counting hashtags will limit understanding, so contextual approaches like those from Kantar Media will be in terms of seeing the full conversation whilst avoiding false positives. The X Factor, dominates, inspiring 8.6% of all Tweets across the year, despite being on air for only four months in the year. Across a broad time period, TV Tweet levels correlate with TV channel shares, although some channels (ITV, ITV2 and E4) over-perform on Twitter relative to audience shares. TV Tweets have a noticeable skew towards entertainment, talent shows, constructed reality, documentaries, some dramas, soaps and special events. Twitter TV activity correlates with audience size at a very broad level: the shows with the largest volume of Twitter TV activity tend to have the higher audiences. Also the correlation is largely one-way: some of the top watched shows have hardly any Twitter volume. Consequently Twitter TV data are influenced by TV ratings, are complementary to them, but are not a replacement for them. Of the top 30 TV series in terms of Twitter volume, 28 were on air the year before. 16 had increased their amount of Twitter activity and 12 had decreased. This correlated strongly with the direction in which their gross audience across the year had moved. Our analysis detected a causal relationship between Twitter activity and viewing levels. 11% of broadcasts had some form of positive causation during the transmission- that is an increase in Tweets followed by an increase in viewing levels. For those 11% of broadcasts where there was a positive effect from Twitter to TV, it added 2% to the total audience during the broadcasts. So, for TV episodes that have a significant volume of Twitter activity, Twitter has a positive causal relationship with viewing during 11% of broadcasts. Looking just at those broadcasts – where a positive effect was detected – a 2% uplift in minute-by-minute ratings (TVRs) was attributed by Granger to Twitter activity during the show. If we re-base on all surveyed broadcasts across the year this equates to a 0.2% uplift overall. 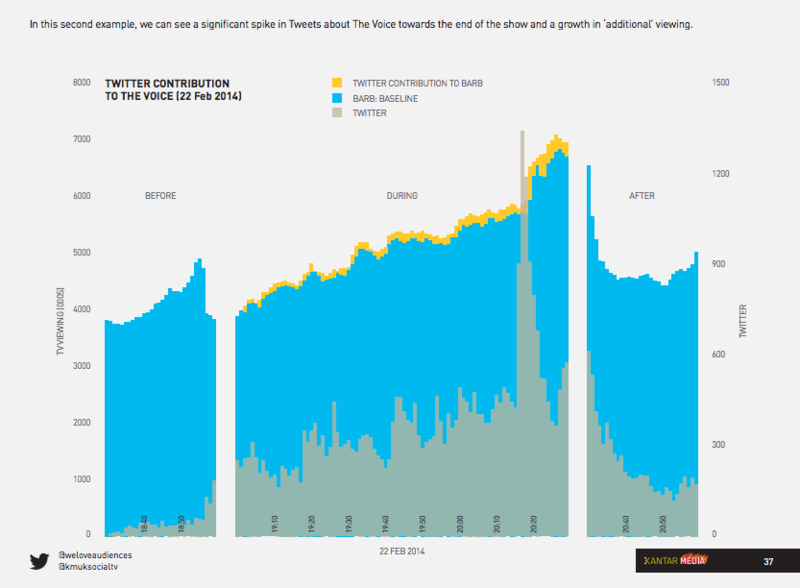 In this example, you can see a significant spike in Tweets about The Voice towards the end of the show and a growth in ‘additional’ viewing. 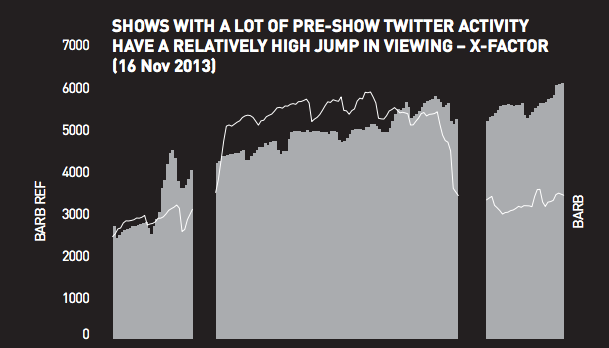 We can see evidence of correlation between immediate pre-show Twitter activity and subsequent uplift in viewing at the start of the show, but this can’t be statistically isolated from other contributory factors that may cause people to tune in (marketing, promotions, word of mouth for example). Consequently our causation analysis looks only at the Twitter effect during the broadcast itself. The top 30 TV series in terms of UK Twitter activity account for 50% of all UK Twitter TV activity, despite accounting for 9.1% of all viewing by volume. Whilst we have seen a good long-term correlation between audience trends and Twitter volume for the Twitter TV Top 30 series with the most Twitter activity across the year – the relationship is less evident if we look within series at trends from episode to episode. However, most successful TV series attract fairly loyal viewers and therefore there is little variation in viewing from episode to episode anyway. This minimises the opportunities for correlation with Tweets, which are driven more by episode content. The grey shape is the ‘normalised’ viewing shape for the show at that time, day and duration – the reference – with the actual viewing overlaid: the white line. You can read the entire research here.